Need to Get Noticed in the Pin Up Community? Do You Have A Product That Is Amazing and You'd Love to Get Great Exposure Amongst The Pin Up Community? Are you an owner of a business with focus on the pin up community? Are you a pin up model who wants to get noticed by the right people? Are you a pin up photographer seeking more exposure? So you have something you want to sell. But no one will buy it if they don't know about you right? What if you could have exposure to 41,800 people who are in love with everything pin up. They are a highly targeted audience with a burning desire to satisfy their passion for all things pin up. This kind of exposure is possible for you...if you take action. Pin Up Passion is a website dedicated to everything pin up. At present we have over 60,051 people monthly visiting our website and another 68,799 people actively interacting on Pin Up Passion's social media channels including Facebook, Youtube and Twitter. 128,850 people. And this number is growing very, VERY quickly. PinUpPassion.com is THE largest pin up girl information site on the web and the most active pin up loving Facebook community. Imagine how many people would notice you if you could be featured on the Pin Up Passion home page for a week? What kind of exposure would you get from having your photos of your product displayed in a Pin Up Passion photo album with links directly under the photos leading people to your sales page or a page we create for you on Pin Up Passion? What would it mean for your online presence to have a webpage built about your brand on the Pin Up Passion website - a website with a solid following of fans which is trusted and respected? 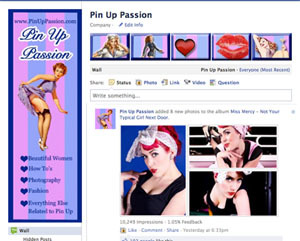 Can you imagine if Pin Up Passion posted on their Facebook wall how much they love your brand, followed by receiving up to 1933 likes, 577 shares and 189 comments on the post? Would that be good exposure for you? All of the above would be done over a one week period which would create hype about your product. Everywhere the fans of Pin Up Passion would look, they would see your product and brand. Pin Up Passion wants to make you known! Having exposure to 128,850 targeted pin up lovers is basically priceless for your pin up related product. You won't find many companies that offer this opportunity. "Absolutely LOVE this page. Just recommended it to two of the models I am working with in an upcoming shoot. Great wealth of information for beginners :). ♥ Vixen Express"
"Amazing page!!! Just love it here, feel like I'm at home!" Who is eligible to apply for this offer? Yep...not everyone will be considered to be featured by Pin Up Passion. We need to make sure you are a respected brand with a lot to offer to the pin up community. We want to provide our fans with only the best brands of products with exceptional focus on delivering high levels of customer service. If you think your brand and product are top quality and of high value for the customer contact us now and we will assess your product to decide whether we are a match. This is even better news for you, as Pin Up Passion will specifically asses your product and make sure it's a match for the Pin Up Passion community to ensure you get an excellent return on investment. Whether it's a one off event, or something you want to do on a regular basis, Pin Up Passion can help you get noticed. We can arrange for your feature to be running a week or continuously! Just let us know what you are after and we can find an arrangement suitable for your needs. So contact us now to have a chat to our friendly team about what is best for you. All of this happens over a span of a week to ensure there is significant hype created about your product to catch the fans attention. AND as a bonus, we are now including a Facebook post from Pin Up Passion on our Facevook page (so reaching the 35,050 fans) about your product, valued at $195 in this pack free! Hurry...offer ends soon. Contact us now. P.S. The Pin Up world is speeding ahead whether you’re ready or not. Don’t get left behind. Expose your product to a mass and targeted Pin Up audience – TODAY.